High performance sports yacht or family trailer sailor, the Zenith XS8 introduces fresh design and thinking to the small yacht market. Steve Raea filed this review. With nothing new on the production trailer sailor scene for well over a decade, Whangarei-based Zenith Boats knew it was a commercial risk when it launched the Zenith XS8. Locally designed by Craig Loomes and engineered by High Modulus in solid GRP, the XS8 is best described as a crossover between a family-orientated trailer sailor and a hard-out sports boat. The difference lies primarily in the sails used on the day. The first XS8 was launched seven years. It was originally developed by a syndicate that ran into financial difficulty and mothballed the project before the design could gain any traction. The moulds were subsequently purchased by Zenith Boats in 2003 and completed to a high standard before being put into production. Three boats have been launched to date. 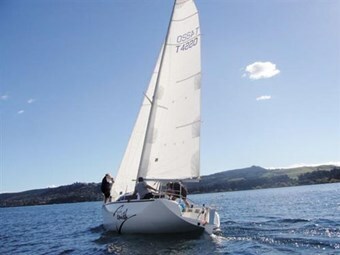 While this hardly constitutes a class, the design's second-placing overall at last year's trailer sailor nationals at Lake Taupo created some much-needed interest in the new design. Zenith Boats owner and manager Mark Workman is a young guy with big aspirations. Zenith Boats produce a small range of fiberglass runabouts including Workman's own design - the new 5.9m Aggressor. The boat has received excellent reviews and looks set to springboard Zenith Boats into the big time. All this, however, has meant less time to market and demonstrate the XS8. At 8.0m overall and weighting an estimated 1800kg on trailer, the XS8 is at the top end of the trailer sailor market in terms of size and as such presents a handful for the inexperienced. Zenith sales manager Brent Wilson says, however, that looks are deceiving. Wilson's job regularly involves towing, rigging and launching the yacht on his own. He says the XS8 is no more difficult than any other trailer sailor and can be mastered quickly with the use of items including the yacht's electric centerboard winch. He might be right, but the Fosters mast is particularly lofty so I will stand my ground on this point. The Zenith-designed trailer does have a number of unique fittings to aid launching and retrieval including a large extension drawbar, moulded fiberglass cradle and foldaway arms that guide the yacht onto the trailer chassis. Available as a hull and decks, Zenith offers the yacht at various stages of construction to appeal to the home builder. Interior layouts differ according to customer demand and can include such luxuries as a private head and shower unit. This, of course, comes at the expense of accommodation. Zenith's demonstrator has been fitted out to a high standard with a separate head, small galley and table, one double and four single berths and - believe it or not - a 20hp inboard diesel engine. Sailing systems and spars are all top of the range Harken, Spinlock and Fosters products. To look at it, the XS8 has all the appearance features of a sports yacht with a full walk-thru transom, rounded transom and sleek cabintop profile that provides useful decks for the foredeck crew to work the mast and bow. A real feature is the over-sized T-shaped cockpit and stainless steel tubular rudder plinth bolted to the transom. The layout and design is tailored to suit the helmsman and trimmers more than it is for mum, dad and the kids. The yacht is conventionally rigged with a fractional deck-stepped mast on a very substantial galvanized hinged bracket. The rig does not carry a backstay or runners and thus has a pronounced aft angle at the spreaders. All halyards and reefing lines are led aft through Spinlock clutches to secondary Harken winches on the cabintop. The mainsheet traveler is well aft of the companionway and does not therefore impede access to or from the companionway. Fitted with both inboard and outboard genoa tracks, a variety of headsails and sheeting angles can be used. Cockpit stowage is marginal with one shallow watertight locker for winch handles, spare sheets and the like with a second locker giving overhead access to the starboard quarter berth. Another two open lockers are located further aft for the likes of gas bottles and spare fuel. The XS8 interior has two modes - that when the centerboard is up, and when it is down. The difference between the two is huge and both make and, unfortunately, break the boat. In up mode, the interior is dominated by lengths of aluminium tubing that run up, along the cabintop, and back down the side of the galley bench. These are used to form a solid frame on which to support the 500kg weight of the centerboard when in the up position. To this frame is attached the electric cable drive unit - a bulky box that protrudes into the companionway making it tricky to get up and down the companionway stairs. Because, too, the galley bench is formed in part by the centerboard case lid, it can't be lowered while the centerboard is up. The net result of all this is that the saloon is effectively cut in half and the galley marginalized when the board is raised. Moreover, while the aluminium cradle is both strong and effective it looks like an eyesore and detracts from what could be a tasteful interior. However, drop the centerboard, remove the aluminium tubing, stow the winch and cable (on the quarter berth) and hey presto - what a different boat. The problem is this. The centerboard is either up or it is down. There is no middle ground. One of the great benefits of trailer sailors as I remember it is the ability to raise the board and rudder and run the boat up on the beach or mangroves so the kids and dog can come and go as they please. This is particularly enviable when at crowded anchorages. Yes, the centerboard can be partially raised when the tubing framework is in place, but the disadvantages far outweigh the advantages. For this reason I see the XS8 falling more into the sports boat market more than the family cruiser market. There is no doubt that Craig Loomes and Zenith Boats have created a lot of internal volume considering the demonstrator has an inboard engine, enclosed head and accommodation for five. 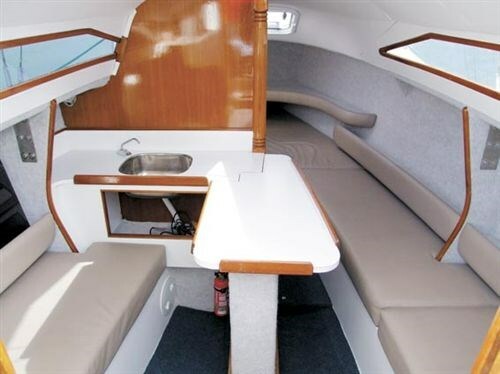 The boat is light and airy and nicely finished with teak trim and frontrunner internal linings. The campanionway stairs are moulded as a single unit giving easy access to the engine. The galley is set to port and backs against the main bulkhead with the small table amidships. The demonstrator was not fitted with a stove but did have a single stainless sink with pressure water pump. A stove is an option but at the cost of the port side saloon settee. 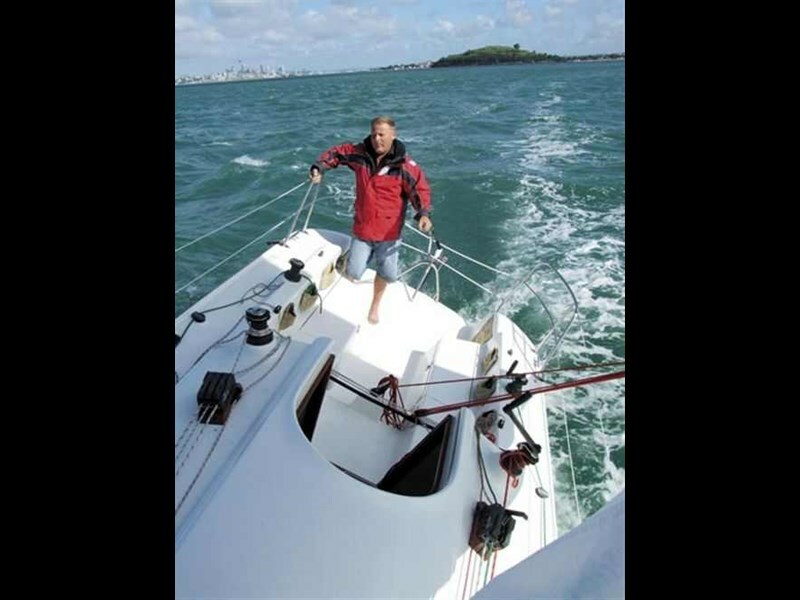 With just Brent Wilson and myself onboard, the 20-knot south westerly on Auckland Harbour was always going to be handful given what was an excessive mainsail for short-handed sailing. With no backstay to limit mainsail roach, Whangarei-based Caliber Sails did not hold back when asked to make a light airs, race-winning main. Despite putting an early tuck in the main; it was all we could do to stagger to windward with the tiller somewhere up around our ears. For all of that we made rapid progress up harbour devouring everything along the way. The yacht's 46 per cent ballast ratio is clearly adequate and the torpedo bulb 1.8m below checked our leeway very effectively. As Wilson later lamented, with six gorillas on the rail we would have been in sailor's heaven. The XS8 is obviously a fast yacht and like most thoroughbreds requires a bit of tweaking to get the best. Off the wind and downwind the big main comes into its own with the boat responding instantly to the slightest change in pressure. Without instruments fitted it was difficult to estimate boat speed but there was consensus that we were maintaining a good six knots to weather and a conservative eight knots off the wind. I can only accept Wilson's reassurance that with a standard main the XS8 is both well-mannered and easily managed by a husband and wife crew. A real plus is the XS8's inboard diesel that proved its mettle as we plugged a spring tide returning to Half Moon Bay Marina. With a weight difference of just 15kg over the smaller 10hp Volvo, Zenith Boats correctly elected to fit the twin cylinder 20hp model. Wilson informs that the XS8 will motor at eight knots. Even with a plugging tide we managed a comfortable six knots against wind and tide at cruising revs. For my money, the XS8 is the perfect syndicate racing boat; a boat that can mix it up with similar sized sports yachts in around the cans and short-offshore races with the added benefit of being able to be packed up and towed to regattas around the country. I suspect the boat might be too much of a handful in terms of size and price to have real family appeal, but time will tell. 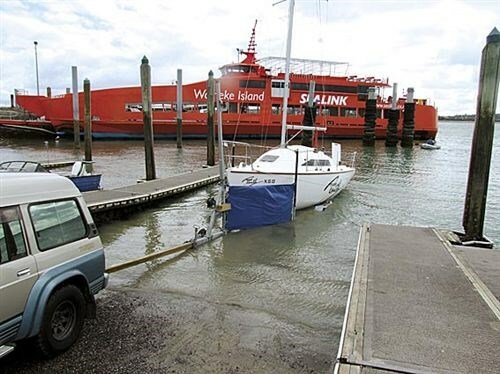 Workman says he would like to find time for himself or other suitable parties to get the yacht out in front of sailors to demonstrate its true potential. "We know we have something here. We also recognise that there is a limited market in New Zealand so it's going to be a challenge to get the XS8 out there in numbers. Ideally, we would like to get the design to Australia and hopefully tap into the larger Aussie market. Unfortunately our resource is being channeled into tooling a new 6.8m trailer boat that we hope to release in October." He says that work does not preclude Zenith from meeting orders for the XS8 or the company's willingness to demonstrate the yacht to interested parties. "Brent is constantly traveling throughout the country and loves any excuse to get the yacht out and show people what its got. We look forward to inquiry."